Air pollution on one of the UK’s most polluted roads has gone unrecorded for nearly half a year after the site’s official monitor broke down, council officials have said. 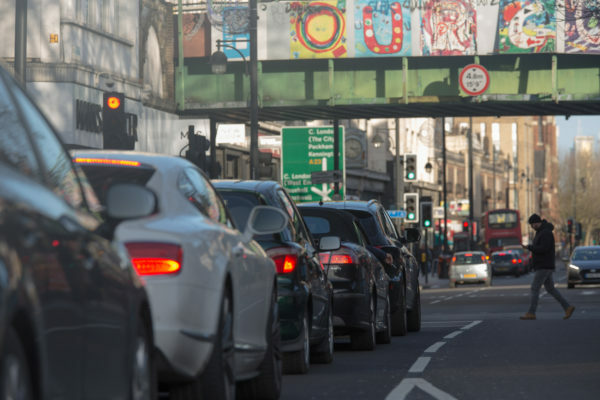 Brixton Road, in South London, has made national headlines in recent years for exceeding the annual legal limit for peaks in air pollution before the end of January. But this year it’s unknown whether the breach has been made because data at the government’s official air quality monitoring site hasn’t been recorded since 29 August 2018 – a situation City Hall told Unearthed was “simply unacceptable”. The news comes as some parts of the UK have been hit by “very high” levels of pollution this week, nearly three times those recommended by the World Health Organisation. With the UK continuing to record illegally high levels of air pollution, tensions over how best to deal with the crisis have been rising in recent years as central government has been accused of passing the buck to budget-squeezed local authorities and city mayors. Jonathan Bartley, co-leader of the Green Party and a Lambeth councillor, said the council was “choking its citizens and putting lives at risk by leaving air pollution in one of Britain’s dirtiest streets unchecked”. The council’s statement added that the breakage was due to flooding last August. A spokesperson from City Hall said Lambeth’s response to the breakage was “disappointing”, and that it had offered the council assistance to fix the issue. “Councils are responsible for the maintenance of local air quality monitors which deliver crucial insight into the sources of pollution,” they said. The Brixton Road monitoring station is part of the London Air Quality Network, the government’s system for recording air pollution information on behalf of the public. Experts say the monitors are large, complicated and go offline fairly frequently. They check the air quality continuously and small data gaps are impossible to stop. But research by Unearthed shows that so far this year, some of London’s most polluted sites have had lower rates of data recording for NO2, known as capture rate, than previous years. While the Brixton Road site has been broken for the entire year so far, the station at Putney High Street, another pollution hot spot, was also out of action for several weeks in January and February. Wandsworth Council told Unearthed that the “delicate monitoring kit” in Putney had a “failure of internal components that caused power shortage”, and that it was fixed at quickly as possible. The air quality information gathered by the Brixton and Putney High Street sites are required under UK law to report to DEFRA. Notes issued by the government say that a monitor usually needs to capture at least 90% of the air quality data at its site to determine the area’s compliance with EU pollution limits. However, while the failure of the Brixton Road monitor will deprive London residents of important pollution data, it will not have repercussions at EU level. The Brixton Road and Putney High Street stations only report nationally, and are not part of the Automatic Urban and Rural Network (AURN) – a smaller selection of monitors that the UK shares with the European Commission to prove its system complies with EU rules. Unearthed has found that the reliability of some AURN sites has been higher than those just on the UK’s national network of air quality monitors. Local councils say the monitoring stations are complex pieces of equipment, and prone to breakage. But Unearthed has found significant variation in the reliability of monitoring equipment between councils. Simon Birkett runs the Clean Air in London campaign and has raised the issue of broken monitors with DEFRA before. In 2017 Unearthed spoke to a number of local authorities that said they did not have the funding to properly tackle their air pollution problems. In response to the public danger posed by toxic air, the government has asked most of the UK’s largest cities to submit plans to reduce their pollution. But local officials have raised concerns that the funding being offered is unfeasibly low. The money, which is to be split between all local authorities but which London is not eligible for, includes a recently increased £275m ‘Implementation Fund’ and a £220m ‘Clean Air Fund’ to help minimise the impact on local businesses. Many cities missed the December deadline for the plan submissions. Birkett believes that the tight funding may well be impacting the monitoring network, as some of the monitors need replacing, not just repairing. “We really need the mayor, local authorities and the government to all recognise that these monitors are the bedrock of knowing what the hell is going on,” he said. The government’s Department for Environment, Food and Rural Affairs, which is ultimately responsible for monitoring and improving the UK’s air quality, declined to comment.